Paddy gained his Second F.C.I. International C.A.C.I.B. 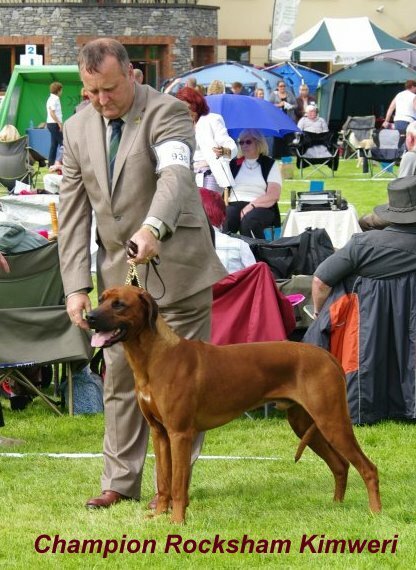 at the IKC International Show in September and a week later his first CC under E.K.C. 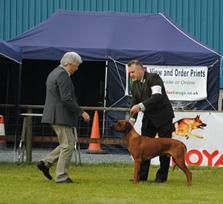 regulations at Belfast Championship Show. 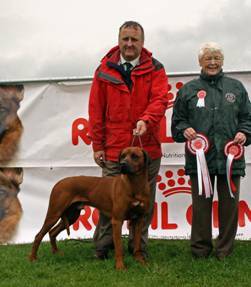 Throughout the summer and autumn of 2012 he has continued to win at both Green Star and Group Placing level and is currently the top winning Rhodesian Ridgeback in Ireland. 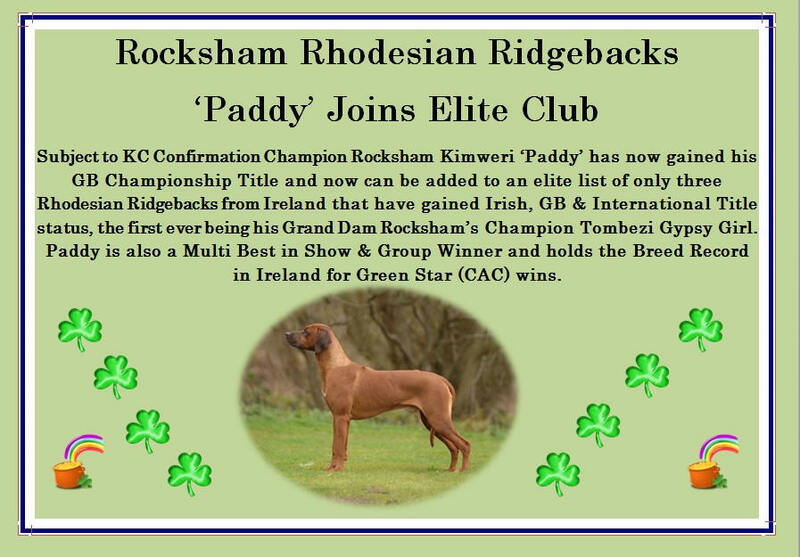 We are so proud of Paddy and also his sister Penny 'Rocksham Kitambi'. 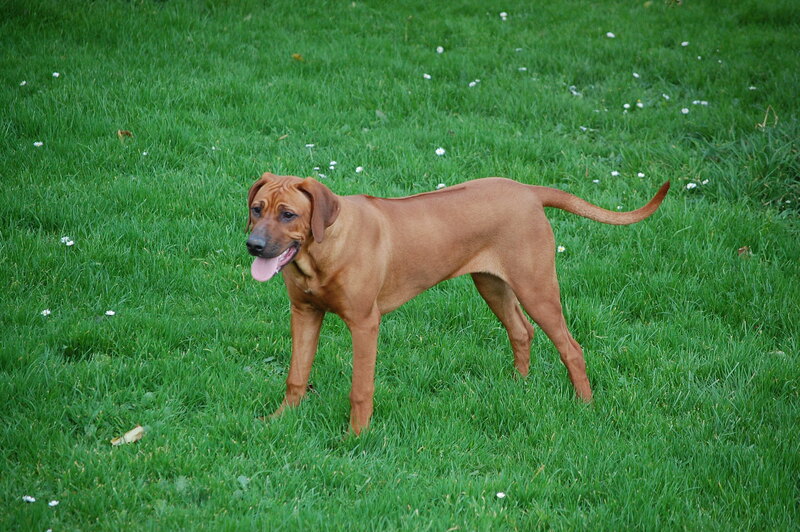 Both so true in type and to the breed. 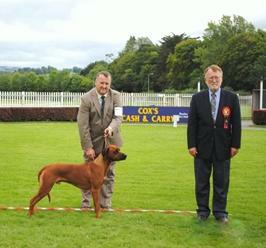 Champion, Jr. Ch & Celtic Winner Rocksham Kimweri won his first Hound Group (FCI 6) at Cork & Dist CC on June 3rd this followed from the previous day's 2nd place in Group 6 at Munster Canine. 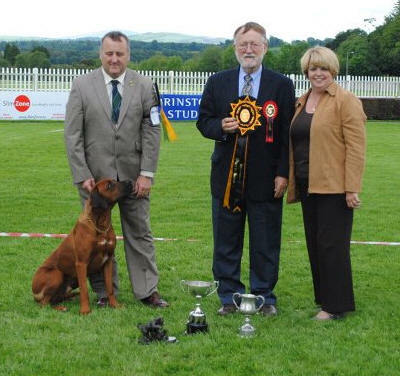 A great weekend of wins for Team Rocksham. 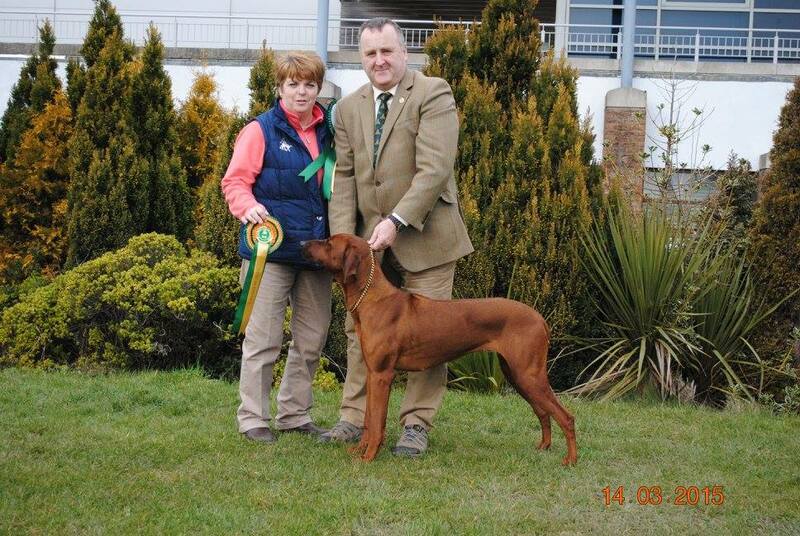 Champion, Jr. Ch & Celtic Winner Rocksham Kimweri took Green Star, BoB & Hound Group 4 at Banbridge & District All Breed Championship Show on 15th April 2012. 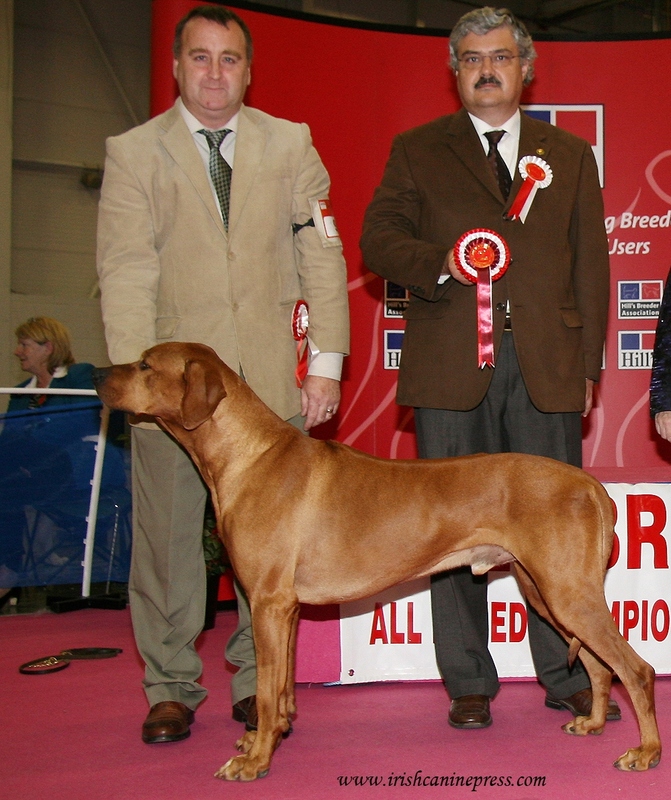 Champion, Jr. Ch & Celtic Winner Rocksham Kimweri took Green Star, BoB & Hound Group 4 at the Irish Kennel Club's St. Patrick's Day All Breed Championship Show in Dublin on 17th March 2012. All this just 2 days after his second birthday. 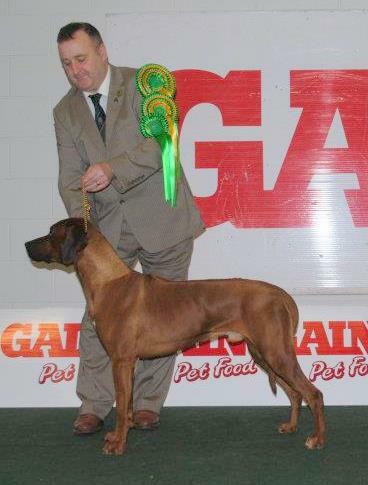 Champion Rocksham Kimweri (Paddy) wins Champion Dog & Green Star Dog at the Dublin Dog Show Society Christmas Show in Dublin under Judge Mr Mick Drennan. 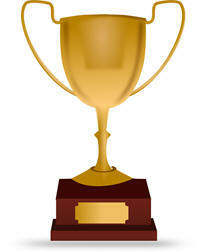 Paddy has now been confirmed as having gained his Championship title. 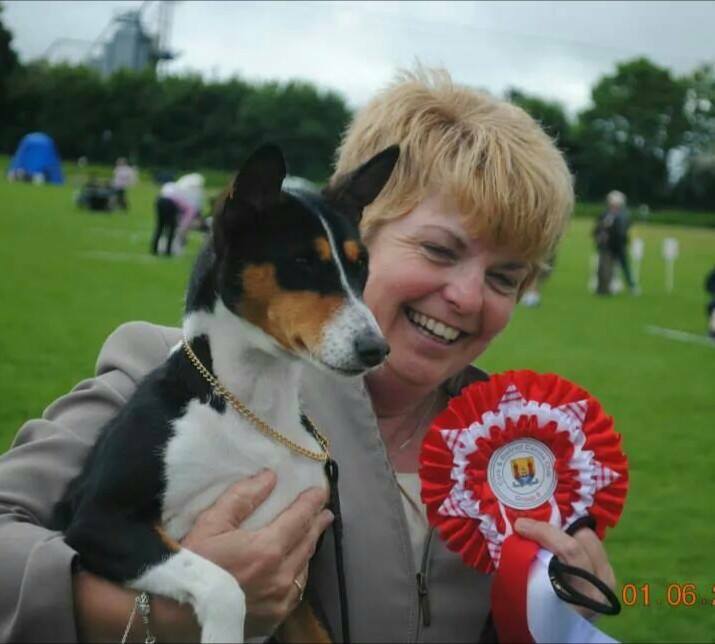 He was awarded his seventh and qualifying Green Star (CAC) at the Cloghran Championship Show in November under judge Mrs Zeta Fogarty. 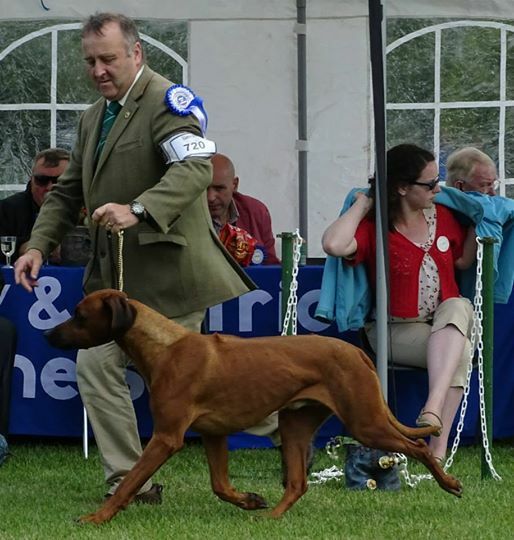 Paddy won his first Green Star at Swords in June 2011 and in five months and at the young age of only 20 months has gained his title. 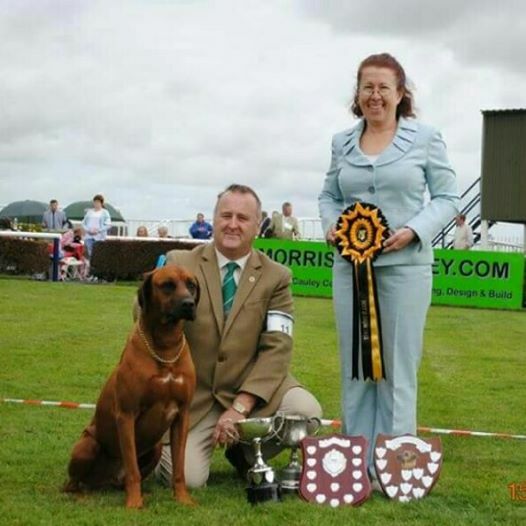 He has had a lot of success over the past six months both in Ireland and the U.k. including Best in Show at the Rhodesian Ridgeback Club of Ireland's 25th Anniversary Championship Club Show in August. 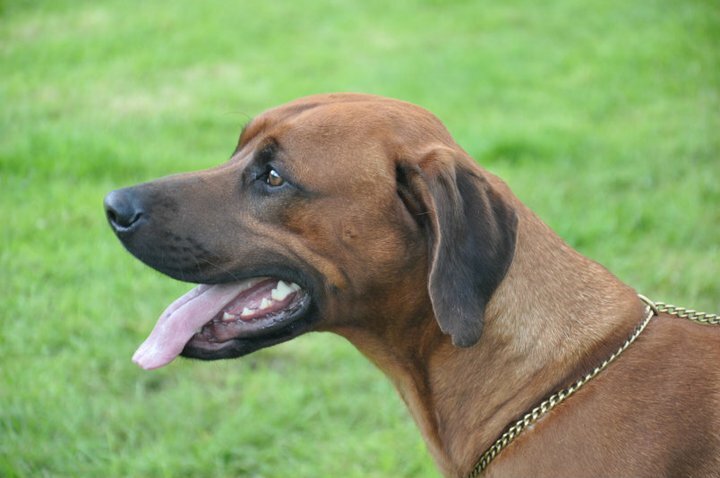 Paddy adds his name to a long list of home breed champions from our top winning kennel. 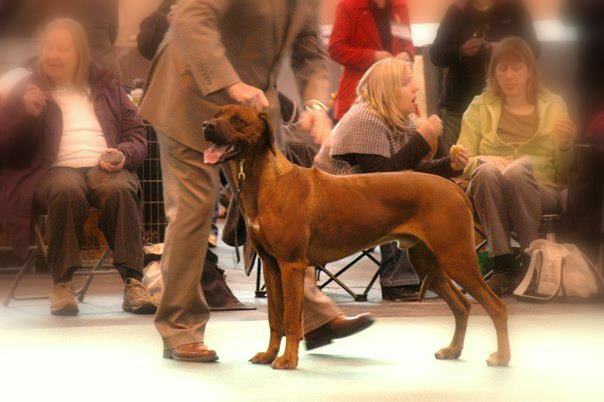 Rocksham Kimweri & Kitambi travelled to Paris for the World Show making them the First of the breed from Ireland to be exhibited at this event. 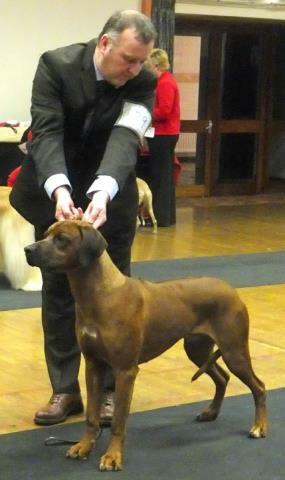 We are very proud of our two young hounds who took this experience in their stride. 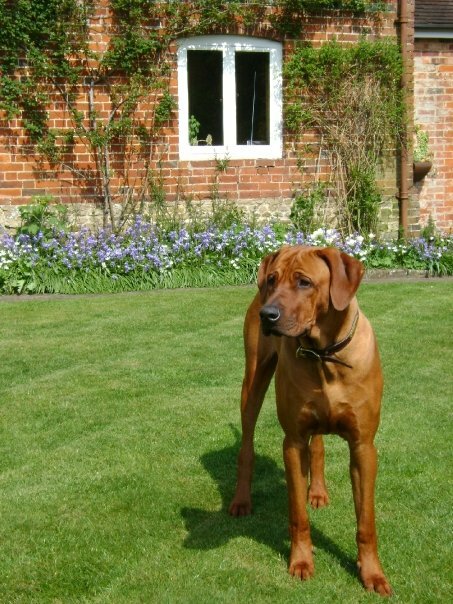 Over the 3 days of competition, at the World, French & Breed Club shows, both had great results being short listed, from classes of almost 30 other Ridgebacks, to the last 6 and gaining Excellent Grading. A great weekend meeting up with friends both old & new. 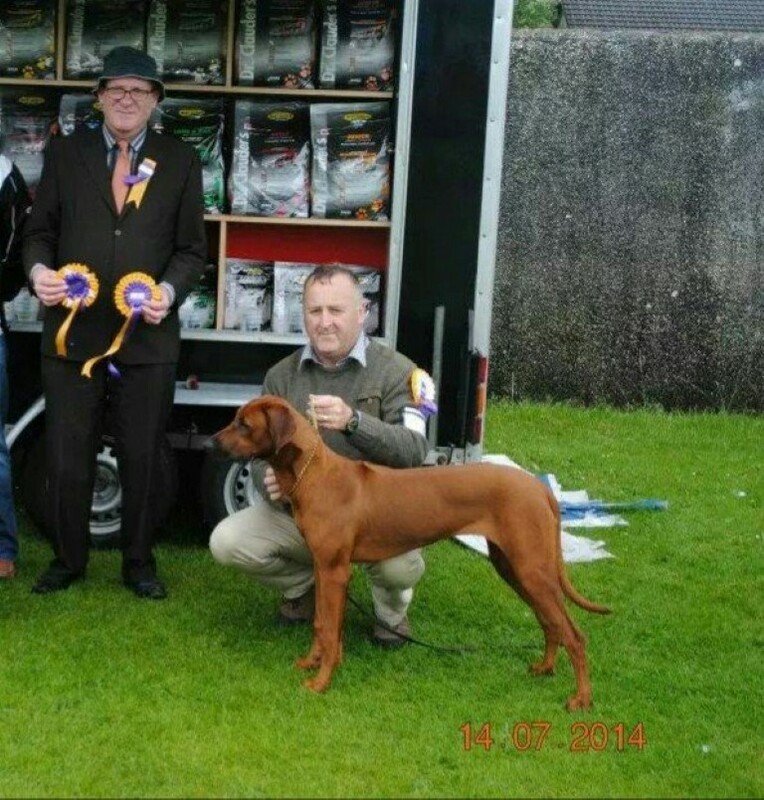 Kabi takes Group 6 Win at All Ireland Bull Breeds Assc.